Herb & garlic cream cheese adds flavour and creaminess - comforting and yet exotic, this tomato soup is scented with ginger and warm seasonings! Heat oil in large saucepan on medium-high heat. Add next 3 ingredients; cook and stir 5 min. or until onions start to soften. Add seasonings; cook and stir 1 min. Stir in broth and tomatoes; cover. Bring to boil. Simmer on medium-low heat 20 min. or until slightly thickened. Remove from heat; use immersion blender to purée soup until smooth. Return saucepan to medium-low heat. Add cream cheese product; cook and stir 5 min. or until cream cheese is completely melted and soup is heated through. Stir in fresh coriander. For a completely vegetarian soup, prepare using vegetable broth. To serve with naan croutons, cut 1 naan into 1/2-inch pieces; spread onto rimmed baking sheet. Bake in 400ºF oven 10 min. or until crisp. Sprinkle over soup just before serving. You can prepare this soup in a regular blender if you don't have an immersion blender. 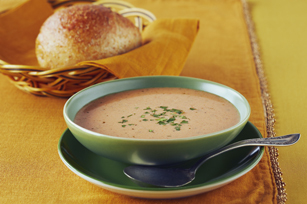 Just blend the soup, in small batches, in the counter-top blender using a kitchen towel to cover the closed lid as each batch is blended until smooth.